Drastic action is required! First – cut them back. I look for some healthy growth near the roots, and cut off the rest. This hurts, because I am cutting off all the blooms, leaving only stumps behind. But the plants have established root systems so will recover quickly. I give them a spray of mould-kill and scatter a general fertiliser. Next, I fork over the bed, gently lifting the plants a little bit so that the compacted soil loosens, allowing water and feed to penetrate. Finally, I top up the mulch with fresh tanbark and water in well. It takes 2-3 weeks before the new blooms appear, but the plants are now refreshed and will flower well into autumn. Hint: if they are planted in a warm, protected part of the garden, they may flower through winter, into next spring. 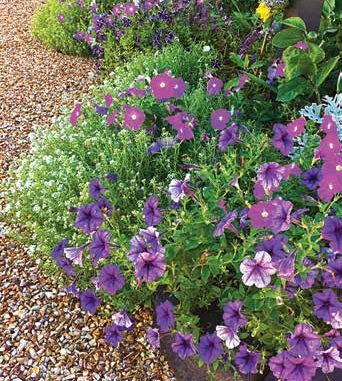 This rescue method should be applied to all annuals – not just petunias. It is much more effective (and cheaper) than ripping them all out and buying new plants. Happy Gardening!